Tuesday, April 9th, 2019 from 1 pm to 2:15 pm EST. This event takes place ONLINE via zoom conference call. The first eight people to register will receive a free copy of the book via mail! In this second meeting of the Groundswell Book Club, we will gather to discuss Zora Neale Hurston's Barracoon, based on an oral history with the last surviving person to be brought from Africa on a slave ship to the United States. Hurston recorded the interview in 1927, but the book was only published for the first time in 2018, ninety years later. Working in the space between folklore, anthropology, and memoir, Hurston weaves together the transcribed words of Oluale Kossulaher with her own reflections on and descriptions of the fieldwork encounter. Reading and thinking about Barracoon can help us to ask questions about how gatekeepers control which stories get amplified, how stories of marginalized people can be shared with broad audiences in ways that are compelling and also respectful, and how the ways that we write shape the stories we tell. The conversation will be facilitated by Andrew Vinãles and Amy Starecheski. ﻿Amy Starecheski is a cultural anthropologist and oral historian whose research focuses on the use of oral history in social movements and the politics of history and property in cities. She is the Director of the Oral History MA Program at Columbia University. Starecheski was a member of the Core Working Group for Groundswell: Oral History for Social Change from 2011-2018, where she facilitated the Practitioner Support Network. She received a PhD in cultural anthropology from the CUNY Graduate Center, where she was a Public Humanities Fellow. Her book, Ours to Lose: When Squatters Became Homeowners in New York City, was published in 2016 by the University of Chicago Press. She is the founder of the Mott Haven Oral History Project, which collaboratively documents, activates, and amplifies the stories of her longtime neighborhood, as told by the people who live there. Andrew Viñales is a cultural worker and oral historian from the Bronx, NY. Currently he is a PhD student in cultural anthropology at the CUNY Graduate Center. Much of Andrew's work is about highlighting Afro-diasporic religion and folkloric traditions from the Caribbean and Latin America through a lens of resistance to white-supremacy and racism. Together with local organizations, Andrew has facilitated conversations with priests of African diaspora traditions including Vodou, Lukumí and Garifuna. If you have any questions about this program, please contact Shefa Nola Benoit at info@rootsandreasons.com. Join us for our first ever Groundswell Book Club! 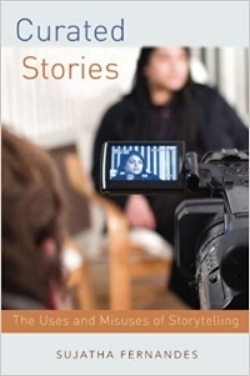 The first session on Thursday, November 1st, 2018 from 1 pm to 2:15 pm EST will discuss Sujatha Fernandes' book Curated Stories: The Uses and Misuses of Storytelling. The book raises critical questions about how social movements use first-person stories. How do movements use stories to produce change? What kinds of stories, and what kinds of storytelling practices, lead to stories that illuminate structural inequality, and lead to structural change? How do funders, movement leaders and storytelling professionals shape the stories we tell? This is an essential book for social justice oral historians. Facilitator Amy Starecheski is a cultural anthropologist and oral historian whose research focuses on the use of oral history in social movements and the politics of history and property in cities. She is the Director of the Oral History MA Program at Columbia University. Starecheski was a member of the Core Working Group for Groundswell: Oral History for Social Change from 2011-2018, where she facilitated the Practitioner Support Network. In 2015 she won the Oral History Association’s article award for “Squatting History: The Power of Oral History as a History-Making Practice”. She received a PhD in cultural anthropology from the CUNY Graduate Center, where she was a Public Humanities Fellow. Her book, Ours to Lose: When Squatters Became Homeowners in New York City, was published in 2016 by the University of Chicago Press. She is the founder of the Mott Haven Oral History Project, which collaboratively documents, activates, and amplifies the stories of her longtime neighborhood, as told by the people who live there. Please read the book. Participation is FREE. To register for the online book club discussion, click HERE. Questions? Please contact Shefa Nola Benoit at info@rootsandreason.com.